Posted on Sun, Mar 25, 2012 : 5:59 a.m. Seven of Washtenaw County’s 10 public school districts, including Ann Arbor, saw a net loss of students to charter schools and other districts in the 2010-11 school year, a statewide report shows. Only Saline, Milan and Manchester experienced a net gain of students last school year, according to statistics gathered by the Center for Educational Performance and Information (CEPI). Students pile onto a bus in Ypsilanti last year. Ypsilanti lost 1,795 of its resident students to charter academies or school-of-choice programs in 2010-11, but attracted an additional 1,153 non-resident students. The hardest hit district was Willow Run, which tabulated a net loss of 1,164 students, equal to 42 percent of its student population. Lincoln and Ypsilanti also lost a large number of students overall. Strictly by the numbers, Ann Arbor had the greatest net loss — 1,222 students — but it’s also the largest district in the county by about 11,000 students. The loss is equal to about 6.9 percent of the public school-age children residing within the district’s boundaries. For every student AAPS lost in 2010, it cost them $9,320 in state aid. Children transferring to a private school or coming from a private school are not included in the CEPI data, which is the most current numbers available. The Center for Educational Performance and Information is located within the Office of the State Budget. Its initiatives in data collection and reporting facilitate school districts’ compliance with the federal No Child Left Behind Act of 2001 and the Michigan Department of Education’s accreditation plan, Education YES, according to its website. The majority of Willow Run students who left last year, 718, opted to enroll in Ypsilanti Public Schools. Students can enroll in school districts where they are not residents through Schools of Choice, non-resident children of employee programs, alternative education programs and for special education services. With most of these non-resident programs, parents are required to provide transportation. Students transferring to another traditional district take with them their state aid — so Ypsilanti would have gotten $9,320 for an Ann Arbor student enrolling in its district in 2010, rather than the $7,813 it got for an in-district student. Charter schools were given $7,410 per student in 2010, regardless of which district the child came from. Chelsea and Dexter are the only Washtenaw County school districts that do not offer Schools of Choice. They also gained the least number of non-resident students in 2010 — 12 and 19, respectively. Seven of the remaining districts have offered Schools of Choice for more than five years. Ann Arbor approved its program two years ago. The majority of the districts are open to non-resident students in only select grades, most commonly at the elementary level. Willow Run and Ypsilanti are the only districts that accept students in all grades, K-12. All of Washtenaw County’s Schools of Choice participants accept in- and out-of-county students, except Ann Arbor and Willow Run. In 2010-11, Lincoln, Milan and Ypsilanti attracted the greatest number of out-of-county students. One hundred forty-nine students living within Van Buren Public Schools district in Wayne County elected to attend Ypsilanti, 87 attended Lincoln and 58 chose Milan. Milan was the big winner in gaining non-resident students in 2010-11. It saw a net increase of 467 students, equal to 21 percent of its student population. Superintendent Bryan Girbach said 628 children were enrolled in Milan through Schools of Choice. That gain was partially offset by Milan's loss of some of its own students to other districts or charter schools. “It’s been very successful,” Girbach said of the district’s Schools of Choice program, which began in 1996. 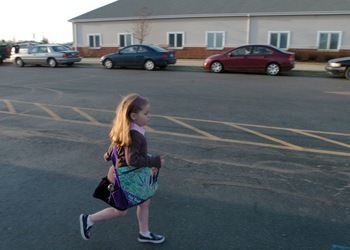 A girl runs across the parking lot to start school at South Arbor Charter Academy. Area charter schools were a big winner in the school-of-choice game in 2010-11. Local students have benefitted from welcoming non-residents, he said. Milan has been able to offer a greater variety of programs, especially at the high school level, due to attracting more students. Girbach said schools need a certain number of students to sign up for a class before they can open another section or add an elective. Most of Milan’s non-resident students transferred from Lincoln and Ypsilanti, 296 and 114 children, respectively. Ann Arbor gained 206 non-resident students in 2010, 95 were through Schools of Choice. Ninety students from Ypsilanti was the greatest number of non-residents Ann Arbor received from any single district. But Ann Arbor sent 98 of its resident students back to its southeastern neighbor. This was the highest number it sent to any of the traditional districts, followed by 56 to Saline and 51 to Milan. Charter schools were the other big winner in the school-of-choice game in 2010-11. If parents elected to send their child to a school other than their home district, it was likely a charter school. Of the 192 students in 2010-11 residing in Milan but not attending Milan, 65 went to South Arbor Charter Academy. One hundred eighty-three students from Ann Arbor also attended South Arbor. The other charter schools Ann Arbor parents sent their children to most frequently were Central Academy, 233, and Fortis Academy, 182. Fortis Academy also attracted 132 Willow Run students in 2010-11. Parents within Ypsilanti Public Schools sent the most children to charter schools. Of the 1,795 students that opted out of Ypsilanti, 277 went to Central Academy, 251 went to Fortis Academy, 171 went to Eastern Washtenaw Multicultural Academy and 108 went to Victor Academy. 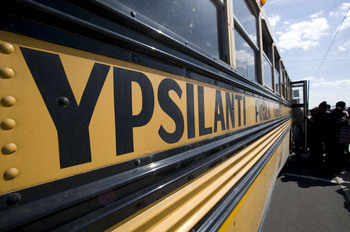 The greatest number of students Ypsilanti had enroll any one of the other traditional districts was 172 to Willow Run. A list of where school-of-choice students are transferring from for each Washtenaw County district is available here. To see which districts and public school academies school-of-choice students are transferring to, click here. The charts contain data for fall 2008 through fall 2010. Editor's note: This story has been revised to correct information in a photo caption. Mon, Mar 26, 2012 : 5:28 a.m.
Open letter to the schools: offer a formal gifted program and you will attract parents and students to your districts. Otherwise, these families will continue home schooling, paying for private school or otherwise shopping around for a more challenging education. Mon, Mar 26, 2012 : 3 a.m.
You write, &quot;Willow Run and Ypsilanti are the only districts that accept students in all grades, K-12.&quot; I'm pretty sure that is not correct. I believe Manchester and Whitmore Lake, at least, are taking students in all grades. Mon, Mar 26, 2012 : 2:01 a.m.
Too much overhead. 10 districts when we should have 1. Playing musical chairs with students. This will never end until ALL 10 districts consolidate. Several Districts are smaller than Ann Arbor High Schools! Really! Administrators, School Boards, for Districts with as few as 1200 students. What a waste of our school $$. We're stealing from our children to keep all the adults employed! Sun, Mar 25, 2012 : 11:38 p.m.
&quot;Winners&quot; and &quot;losers&quot;. What a shame that in 2012 our public education is viewed in this manner. Instead of thinking of public education this way, we should be thinking of how this is the livelihood of a lot of dedicated, hardworking educators. And more importantly, this is the upbringing of our society's next generation of citizens. This is our future. Let's not make our schools into buildings of winners and buildings of losers. Our federal government wants us to believe that education is all about competition. Competition against other nations. Competition against other districts. Competition against other students. It's being turned into a race to a common finish line when it's so painfully obvious that there is no common starting line. Our public (including charter) schools, students, and communities are worse off because of this. We need a new philosophy, and it starts from the top. Come on, Obama. Let's get it together. Mon, Mar 26, 2012 : 1:57 a.m.
Sun, Mar 25, 2012 : 11:02 p.m.
Whatever happened to what I thought was the &quot;Willis school district&quot;? Are Willis' schools part of the Lincoln Consolidated district? Mon, Mar 26, 2012 : 12:04 a.m. Yes, residents of Willis go to Lincoln as do some students in Ypsilanti TWP, Augusta TWP, Milan, Belleville and Sumpter TWP. As a consolidated district its students come from all over the area. Originally the areas were mostly rural, but over the years the area has really built up. Sun, Mar 25, 2012 : 9:57 p.m.
Perhaps Ann Arbor needs smaller class sizes. This would be a strong attraction. After you make smaller classes, you can address other issues more efficiently. Sun, Mar 25, 2012 : 8:41 p.m.
Mon, Mar 26, 2012 : 2:34 a.m.
Sandy, I don't actually begrudge a parent making a choice to pull a child out of a failing school. I get it. But I do have lots of anger at the system that forces the public schools to battle it out with one another over the meager offerings from Lansing, that just keep getting smaller and smaller. Winners and losers? These are KIDS! And they should ALL have a great education. Think of it this way.... if there were no private schools or charters, and all the powerful and wealthy people who make the rules HAD to have their kids in the public schools.... well, how good would they be then? Mon, Mar 26, 2012 : 2:18 a.m.
A2anon, we all have choices and I think the answer to this really lies in where you put your priorities. Is it our priority to educate our children or is it our priority to keep failing schools alive? Personally, my priority is getting the best education for my children, selfish as that may seem. I believe it's my job as a parent. The failing public schools in this area have had many years of money and more money being sent their way. They've had years to prove their value and what they have are failing test scores, violence in the schools, and falling graduation rates. I don't have the answer to their problems, but I don't believe it's that they need more money. More money certainly hasn't helped them up to this point. Mon, Mar 26, 2012 : 12:49 a.m.
Sandy, would it were that your choice did not contribute to the financial demise of the public school system. Sun, Mar 25, 2012 : 10:29 p.m. I know alot of parents whose kids are at Milan. They put their kids in charter schools for K-8 so they didn't have to use any of the Ypsilanti districts. They are very happy with the education their kids are receiving. When their kids enter the high school many of them are at or above the curriculum level of the other kids. Let the public schools pick up their game and I'm sure you'll see an improvement in their enrollment. But certainly, it's your choice where your kids go and it's mine where mine go. Thank goodness we all have the choice. Sun, Mar 25, 2012 : 8:38 p.m. So, Chase. A teacher you know in Ypsi sends his kids to Milan. And we are supposed to conjecture from that anecdote.... what exactly? Mon, Mar 26, 2012 : 1:51 p.m.
Ypsi schools has rough kids and so does WR. Actually WR is more like free babysitting. Larger class sizes. Then there is Ann Arbor and Milan. Gee, no brainer there. Milan is smaller and Ann Arbor has better schools. Especially when Pioneer is top 25 so far in the nation. Go figure. I can really see where this is not an issue of where but of getting a better education. Mon, Mar 26, 2012 : 12:48 a.m.
Hmm. I think he was trying to say something about AAPS vs Milan as well. Sun, Mar 25, 2012 : 10:22 p.m. The conjecture that I got from his comment, and from my own experience in YPSD, is that even the teachers don't think the school system is good enough for their kids. Sun, Mar 25, 2012 : 7:56 p.m.
Mon, Mar 26, 2012 : 1:48 p.m.
Milan has a smaller class size. But if you really think about it, would you really want yours in a WR or Ypsi school setting? I wouldn't. Sun, Mar 25, 2012 : 10:21 p.m. Very few Ypsilanti teachers, principals included, who live in Ypsilanti put their kids in the Ypsilanti Public Schools. I know of one teacher who did and an adminisrator, but I know of more who didn't. Sun, Mar 25, 2012 : 6:21 p.m. I did &quot;school of choice&quot; when my kids were young. My advice to parents is to think seriously about that decision. Your kids will grow older and will become more and more involved in after school activities ( sports- drama- music-NHS -student counsel . Driving at that point becomes a real issue--- I sometimes make as many as six 16 mile round trips to school a day now that my kids are older. My advice nine years into this--- move if you really love a district. Mon, Mar 26, 2012 : 1:47 p.m.
That is all well and good if you can move. If you can't? Then what? From what I see here, if you love a district and want your child to get into it and they don't accept after 6th grade? Transfer in. Thats what I did. Charter to public. We use AATA to get ours to and from school every day. Live too far to get ours onto a school bus. The benefits of a public middle and high school do get your child involved in after school stuff as well.Great option if you don't want to do elementary. Teacher unions are the problem, but not always. Don't forget, even with their negatives, they also run the best public schools we have in Michigan. Unions make failing schools worse, however, since schools rely on people and when it comes to people, unions are set up to resist any change. The logic of a union is that &quot;anyone can do the job&quot; so when infesting a huge industry, those with different levels of ability can be moved around. But teachers are different. Unions by their nature focus on &quot;members&quot; rather then their objective, which is teaching children, which is why unions should never take over a &quot;profession&quot; that has a higher duty to society. Unions will always be a bad fit for teachers on some level because they were designed to protect factory workers during a time that no longer exists. At their worst, they have devolved teachers from a respected profession to an &quot;industry&quot; by protecting &quot;jobs&quot; for the worst and least talented educators &quot;union members&quot;. Sun, Mar 25, 2012 : 4:38 p.m.
Sun, Mar 25, 2012 : 10:17 p.m.
My kid Schools of Choice out of Ypsilanti and into Milan. The only hot mess is the failing public school districts in Ypsilanti. Schools of Choice are saviors for those of us who can't afford to move and who want a good, safe educations for our kids. Sun, Mar 25, 2012 : 4 p.m.
Maybe AA.Com can print the story from today's Heritage.com on how Washtenaw County Charter schools compare academically with the other public schools. It doesn't appear we will get any really useful data from you otherwise. Sun, Mar 25, 2012 : 6:43 p.m.
Sun, Mar 25, 2012 : 5:13 p.m.
a2 - I have. I just think it's interesting that this &quot;news&quot; source does such a superficial job and neglects the real and deeper issues. Shame on me, though, I keep coming back hoping for something better. Sun, Mar 25, 2012 : 4:31 p.m.
Sun, Mar 25, 2012 : 3:13 p.m. I am not sure this article is accurate. It looks to be that Ann Arbor Public Schools lost 80 students from 2009-2010 vs. 1222. The number being reported is the total students that go to charter/private schools vs. the change. Sun, Mar 25, 2012 : 6:38 p.m.
A Voice of Reason, the number being reported is the net loss. In fall 2010, AAPS lost 1,428 students to school-of-choice programs or charter schools and gained 206 students through the same type of programs, making the difference a net loss of 1,222 students. 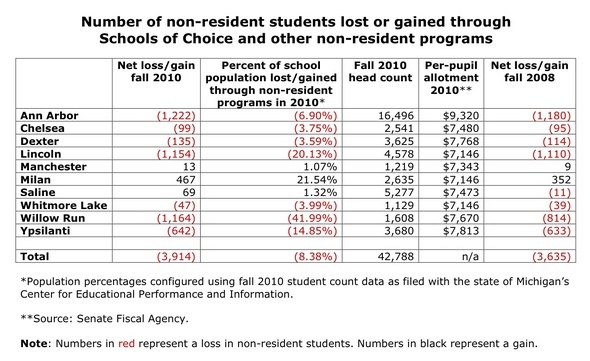 In fall 2009, AAPS lost 1,348 students while gaining 136, for a net loss of 1,212. The links at the bottom of this story detail the numbers obtained via the Center for Educational Performance and Information. If you have any further questions, please don't hesitate to contact me directly. I'd be happy to speak with you more about the numbers. Sun, Mar 25, 2012 : 3:10 p.m. I am not sure this is accurate. It looks to me that we lost around 80 additional students to charter schools or non-resident programs in Ann Arbor vs. 1222. Sun, Mar 25, 2012 : 2:52 p.m.
How come Ann Arbor is 4th from the bottom? Or, in other words what does Milan have that Ann Arbor doesn't? Sun, Mar 25, 2012 : 10:14 p.m.
Milan accepts School of Choice students at every grade level. Ann Arbor, like Saline, only allows kids in at specific grade levels and never past middle school. I think the highest grade level Ann Arbor accepts is the 6th grade. Sun, Mar 25, 2012 : 6:34 p.m. The winner in this are districts that are perceived as being better than the surrounding districts. Milan is probably perceived a better district than Lincoln and districts to the south ( or offer more choice academically because of size). I doubt Many Saline students go to Milan. A2 has to compete with Saline- Dexter and charters, and getting kids to school in Ann Arbor is slow do to traffic. A2 does well against Ypsi as the story shows. Sun, Mar 25, 2012 : 6:14 p.m.
My comment is a reply to the one made by Basic Bob. I've heard from parents in the Mitchell and Pittsfield attendance areas, and the issue in those cases was not funding, but the culture at the school. In one case a biracial child IN FIRST GRADE was tormented for being too smart. Where did her parents send her? To a private school, where she could thrive academically without being ridiculed. In another case, a parent observed high discourtesy at a school talent show and experienced even greater discourtesy upon her request for quiet so the performers could be heard. Where are those children now? At a charter school. Sun, Mar 25, 2012 : 4:41 p.m.
School of choice programs are middle class flight without having to move. What Milan has is proximity to Lincoln. What Ann Arbor is lacking is adequate opportunities for students in the southeastern part of the district. Even with the superior funding in Ann Arbor, students at Mitchell or Pittsfield are better off at a charter. Sun, Mar 25, 2012 : 2:18 p.m.
South Arbor is a good school. No bus system to support,parents drive there children. South Arbor teachers get lots of parental help with there duties.South Arbor has a lottery, not all the children are gifted and talented,they have some of the same behavioral and disciplinary issues as other schools,and some parents who help out and think they know it all. Sun, Mar 25, 2012 : 2:56 p.m.
Sun, Mar 25, 2012 : 2:17 p.m.
Sun, Mar 25, 2012 : 3:03 p.m. It is not the unions. I would say from my observations is that the classroom numbers are just getting too big and in some cases disruptive behavior is a real issue. My kids are no longer in school, but if I saw them in classes this large with one one teacher and no assistance, I would probably seek a school with a good teaching record and fewer students in a class. I agree. Parents need to vote with their feet and use schools of choice to keep their children better educated. We did. I wouldn't put mine in a WR school if you paid me a million bucks to do so. Ypsilanti is no better either. Sun, Mar 25, 2012 : 2:25 p.m. Here we go again with the diatribes against teachers' unions. Never any data, just ad hominem attacks. Sun, Mar 25, 2012 : 2:09 p.m.
Maybe the drop in A2 schools is caused by the realization that a public school education is a public school education. Parents are the more important to a child's education than any school district. Mon, Mar 26, 2012 : 5:38 p.m.
&quot;a public school education is a public school education&quot; So you wouldn't mind having your child (who presumably lives in Ann Arbor based on your username) bussed to Flint or Detroit then, because &quot;a public school education is a public school education&quot;, right? Sun, Mar 25, 2012 : 2:08 p.m. Article: &quot;Students transferring to another traditional district take with them their state aid — so Ypsilanti would have gotten $9,320 for an Ann Arbor student enrolling in its district in 2010, rather than the $7,813 it got for an in-district student.&quot; I'm confused. I had always heard that the lower amount would prevail. That would mean that Ann Arbor students going to Ypsilanti would be worth $7,813 to Ypsilanti, and Willow Run students going to Ypsilanti would be worth $7,670 to Ypsilanti. This disparity would explain why some districts might be reluctant to accept schools-of-choice students (one reason, anyway). Have I been misunderstanding, all these years? Mon, Mar 26, 2012 : 2:50 a.m. Thanks, Steve. I can always trust you to have the facts about schools. Now, how does one get a correction made?? Sun, Mar 25, 2012 : 6:51 p.m.
No, you are correct and the article is not. The &quot;receiving&quot; district gets the lower of the two foundation allowances, though the &quot;losing&quot; district does lose the full amount they would have received if the student stayed. So, an AAPS student moving to YPS only brings with them the YPS allowance, but AAPS loses its $9K. Same in the other direction. The calculus is this: if you have capacity, the added cost of accepting students is usually a lot less than the funding you get. So even for AAPS, $7K is a lot better than nothing. Enticing 25 students to move (enough to fill one classroom) brings in about $175,000, which is way more than the cost of the extra teacher and a little bit of utilities, etc. Sun, Mar 25, 2012 : 2:07 p.m.
School choice is about more then quality education. AA schools are known for core competence but the price is ruthless indoctrination of leftist socialist democrat values that disgust more than half of parents. Given a choice, parents who don't want their kids educated by democrat operatives pushing everything from the global warming fraud to re-election of the worst president in a century would naturally seek more rational education elsewhere. Mon, Mar 26, 2012 : 12:38 a.m.
&quot;AA schools are known for core competence but the price is ruthless indoctrination of leftist socialist democrat &quot; Yeah that's right! If AA public schools would teach intelligent design and parrot big oil talking points, it would be the perfect school system. And if they'd only teach that W was the greatest president of all time in pushing a war in Iraq based on lies, AAPS would be the educational gold standard. Sun, Mar 25, 2012 : 6:26 p.m. I think shepard145 said it a bit harshly, but he's mostly correct. The science classes spend way too much time on global warming, recycling, fracking, and other liberal causes instead of atoms, molecules, sound, light, and physics. Social studies classes ignore Europe and focus on 3rd world nations. It's improper to ignore the 3rd world but just as improper to emphasize it over the everywhere else. I am very unimpressed with the curricula in Ann Arbor. Some of the teachers are great, but bad ones are rarely fired and the absentee rate seems to be abnormally high, well over 10%, costing the district millions in substitute fees. Sun, Mar 25, 2012 : 5:50 p.m.
Sun, Mar 25, 2012 : 4:40 p.m.
What? Seriously....its' about EDUCATION. Can you please leave your POLITICS out of this. WOW! Sun, Mar 25, 2012 : 3:14 p.m. But, how do you really feel? Sun, Mar 25, 2012 : 1:53 p.m. I realize this article and chart are about schools of choice, but the data raise other questions. For example, why is Ann Arbor getting $1500 more per pupil than the next highest per pupil district (Ypsi), and at least 20% more per pupil than any other district? What is that about? Let's see some reason for that kind of disparity. Re: schools of choice, why not discuss the in-district migration from school to school, as there are wide disparities between schools in AAPS for example, and the&quot; illegal&quot; migration of students to AAPS from other districts who scam the attendance boundaries by living with so-called &quot;uncles and cousins&quot; just inside boundaries, but no one verifies that the student is actually living at that address or that the relationship is what they say it is. Legitimate residents in the district are paying hefty taxes and should not be underwriting these scammers. Lots of issues to be examined. Thanks for posting the chart and article. Mon, Mar 26, 2012 : 3:08 a.m.
A chunk of it is expenses. It's more expensive to run a school in Ann Arbor than in Ypsilanti. Sun, Mar 25, 2012 : 2:59 p.m.
Good question. What I can tell you from my experience is that back in 1993 when we voted to replace property tax with sales tax, districts that spent over the average per pupil amount were allowed to be grandfathered at that amount -- the city was allowed to tax us the difference. I only know this because my bank was sending me checks due to &quot;overage&quot; in my escrow account, and to send me a bill for the same amount 6 months later. AA has traditionally had a higher per pupil amount. Back in 1993, we got little relief because of it, AND we signed up for sales tax. It is traditionally high because we as a community support education. Sun, Mar 25, 2012 : 6:45 p.m. The numbers presented in the table only show the traditional local public districts; while charters are discussed in the article, they aren't in the table. Yes, school age population has gone down somewhat, but the shift to charters is a much bigger factor. Sun, Mar 25, 2012 : 1:39 p.m.
Sun, Mar 25, 2012 : 4:43 p.m. So Snoopdog, if Willow Run, Lincoln and Ypsilanti were to close, were exactly do you think the children of these school districts would go? Do you have the 'guts' to tell us that and would you welcome these children with open arms? Sun, Mar 25, 2012 : 2:06 p.m.
Good point, but won't happen. AA dot com is too PC to do a real article on why parents are pulling children from Yspi, Willow Run and Lincoln. You are correct that Ypsi and Willow Run will implode at some point since costs cannot be reduced to accommodate the loss of students. Let's discuss why that is happening. Sun, Mar 25, 2012 : 1:17 p.m. If all 10 of Washtenaw County's traditional public school districts were consolidated into a single district, the per-pupil payment would be about $8,200/student. We could eliminate: 10 administrations in favor of 1 10 bus systems in favor of 1 10 school boards in favor of 1 10 curricula in favor of 1 The savings could be plowed back into the classrooms and we wouldn't have to have discussions about &quot;winners&quot; and &quot;losers&quot; because 10 school districts wouldn't be forced to compete against each other for students, parents wouldn't have to go district shopping and the students would receive a uniform education. Yes, under this scenario, Ann Arbor's per-pupil allotment would drop, but so would Ann Arbor's school taxes. Yes, school taxes in other areas of the county would increase, but I'd take that any day over the Darwinian cage match that's now consuming our local public schools. Mon, Mar 26, 2012 : 1:09 p.m.
Doug, Do you realize that the State of Hawaii has ONE school district? It has 184,000 students, and it seems to be doing fine. I sincerely doubt that the complexity of managing a unified school district the size of Washtenaw County would compare to the complexity of managing a school district that covers a state spread over multiple islands, but if you think that having 8 separate bus systems, 10 separate school boards, 10 separate purchasing departments, 10 different school administrations and paying the top 10 administrators about $1.5 million in combined salaries is efficient and represents an excellent use of the taxpayer's dollar, I guess you're welcome to your opinion. Mon, Mar 26, 2012 : 12:14 p.m.
Just look at the success Memphis has had ...not! Sun, Mar 25, 2012 : 10:52 p.m. I got deleted on my 1st comment. Let me put it another way. Are you aware of the complexities of administering a school district, especially one of tremendous size? Sun, Mar 25, 2012 : 8:23 p.m.
@Steve Norton, With a 160% increase in school-age population, there should be plenty of room for savings. In fairness to the rest of the state, the hold-harmless grant is a relic which should be phased out. Of course what is good for Ann Arbor is important, but what is good for Michigan is essential. Aside from the politics of it (not sure Saline or Manchester would welcome a school board largely elected by Ann Arbor's larger population....), the numbers aren't quite right. I'm not a lawyer, but I strongly suspect that if AAPS merged with other districts, it would lose the ability to levy the &quot;hold harmless&quot; millage, which is a local tax that provides $1,234 per pupil. Without that, AAPS's allowance would be around $7,800. There are some tricks to how they compute the new allowance for merged districts, but you can see that the average would be well under $8K. Sun, Mar 25, 2012 : 6:04 p.m.
North Carolina has 100 counties and has, over the last number of years, moved into having one school system per county. I'd suggest checking several counties, both with the schools in the county seat and with the schools in the outlying areas, in order to assess whether the move would be good for students in Michigan. Sun, Mar 25, 2012 : 2:54 p.m. I agree. Who on earth would go along with that scenario. Ypsi and WR are talking consolidation. AAPS is miffed they are not included with this deal. Lincoln wants nothing to do with this. As for Dexter, Chelsea and Manchester? Dexter and Chelsea did consolidate some, but Manchester is way too far out to be of any help and this includes Milan. Good luck with that scenario. AAPS would never go along. How could they survive without getting 20% more per pupil than any other district in Washtenaw County? Sun, Mar 25, 2012 : 1:03 p.m. Hasn't the newest data shows that Ann Arbor charter schools did worse on standardized tests than AA public Schools? Standardized tests are not the only reason to send your students to charter schools, but it's interesting. Sun, Mar 25, 2012 : 12:56 p.m. Uh, when did South Arbor move to Wayne County? Sun, Mar 25, 2012 : 12:55 p.m. The photo caption says South Arbor Charter Academy is in Wayne County... might want to fix that! Sun, Mar 25, 2012 : 3:22 p.m. Thank you. That's been corrected. Sun, Mar 25, 2012 : 3:20 p.m. The reporter may have gone to AAPS. Sun, Mar 25, 2012 : 12:43 p.m. It would be interesting to see which schools students are choosing to attend locally. I know quite a few families in Ann Arbor and Ypsilanti who use schools of choice to attend schools within AAPS. Also, which schools are losing students to other schools within their own borders? There is educational disparity by neighborhood within Ann Arbor and Ypsi, and it would be very relevant to shed light on that. It seems amazing that should be the case in this small of a city, but is. Sun, Mar 25, 2012 : 11:46 a.m. I am a subsitute teacher in most of these school districts and what it looks like to me is warm bodies in the seats. It isn't about education persay it is get as many kids in the classroom as possible and do the best you can education. And oh by the way you have to do it on less pay and less benefits, have a nice day! Mon, Mar 26, 2012 : 5:33 p.m.
@katmando: Are you personally referring to your students as &quot;warm bodies&quot; or is that how you think the Administration &amp; state officials view them when looking at funding data like in the article? Either way, your comment could have been written a bit better so people think you really care about teaching (if that is how you actually feel). And, you know, as a teacher you might want to make sure your comments are grammatically correct... otherwise you just make the profession look bad. Mon, Mar 26, 2012 : 2 p.m.
bob? From what I heard? They only take the smart ones. They are real picky on who they let in and why. I know IB bases it on test scores. We opted out because ours wanted more to hi school then just homework. Sun, Mar 25, 2012 : 3:47 p.m. I thought the object was for YOU to do the educating? But you are worried where your customers are coming from? And oh by the way, how much do you think you are worth? JNS - there are at least two charter high schools in the Ypsi/Ann Arbor area. Sun, Mar 25, 2012 : 3:04 p.m. I how you never &quot;teach&quot; my kid! I'm not sure how many educators would refer to students as warm bodies. No wonder you're still subbing. Sun, Mar 25, 2012 : 2:51 p.m. I remember a comment from a WR hi school teacher once. It is not the number in the school but how many we can graduate to make a difference. The numbers do not surprise me and when it comes to hi school? This is where they feed into the public school system since there is no charter hi school, yet. Sun, Mar 25, 2012 : 11:11 a.m. The per pupil expenditures only come partly from the state. The rest is made up with local taxes. The state gives the same amount to each school and the district can opt to raise additional funds. I do not believe that the additional funds go to the choice school. Only the $7k base allotment from the state. That's not quite right. The total per pupil allowance is set by the state legislature, and it's different for every district (depending on where they were in 1994 and on changes since then). Each district is expected (read required) to levy 18 mills of property tax on commercial property - that's the local contribution. The state then &quot;tops off&quot; that amount up to the final per-pupil funding. AAPS is an exception, because they were $1,234 above the state formula maximum back in 1994. As a result, AAPS is legally allowed to levy property tax on homeowners in whatever amount is necessary to generate $1,234 per student. That's why this part of the tax changes every year - it depends both on student numbers and property taxable values. When a student transfers between public schools (local districts or charters, doesn't matter), the law says that the district accepting the child gets the *lower* of the original or destination district's per-pupil funding. The district losing the child loses whatever its per-pupil grant would have been. So, for instance, because AAPS's funding allowance is higher than, say, Ypsilanti's, a student going from AAPS to YPS only takes with them the YPS grant, though AAPS loses the full amount. A student going from YPS to AAPS carries with them the YPS grant, which YPS loses. AAPS does not get the higher level of funding for students coming from outside AAPS. Sun, Mar 25, 2012 : 10:18 a.m.
Sun, Mar 25, 2012 : 2:57 p.m.
Nope. It is exactly the opposite. Musical chairs limits the seats and you are left out. Here, there are other chairs to seek.